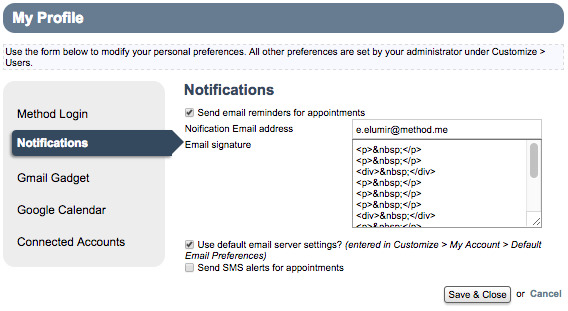 At the top-right of your Method screen is a hover menu with your user name displayed. Hovering over this menu and clicking My Profile opens a five-part profile menu that gives you control of various aspects of your Method experience. This documentation will explore each section in greater detail. 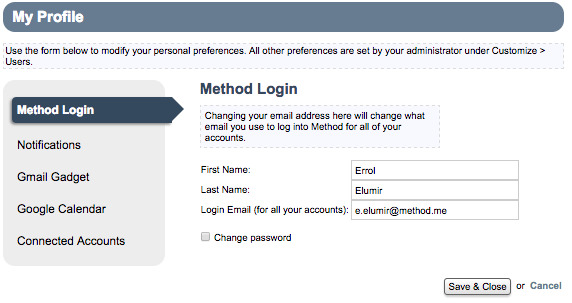 The email you use to log into Method does not have to be the same email you use to receive notifications. Please see the next section. Please see Email settings for information on filling out these fields. Charges for SMS notifications may apply, depending on your service provider. This section allows you to personalize your options for using your Gmail Gadget. From this screen you can enable your gadget, switch the default Google account it's associated with, and set the defaults for the gadget's tabs. In order to use the Gmail Gadget, you must be a Google Apps user. For more information on the Gmail Gadget, please click here. For more information about your Google Calendar, please click here. This section shows whether your Google and/or Intuit accounts are connected to this Method account. You can easily disconnect either account by clicking Disconnect. To learn to connect your Google account, click here. To learn to connect your Intuit account, click here.